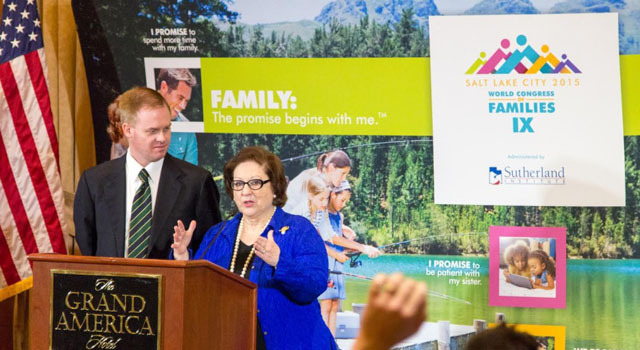 On October 27, mainstream political figures, members of right-wing media, and domestic and foreign anti-LGBT extremists will gather in Salt Lake City, Utah, for the World Congress of Families' (WCF) ninth international gathering. While the World Congress of Families bills itself as a global coalition of "pro-family" organizations, it has deep ties to extremist anti-LGBT movements abroad, and its gathering will serve as a meeting point for well-known US anti-gay extremists to interact with mainstream US politicians and conservative media figures, along with international anti-LGBT activists who support efforts to criminalize homosexuality. Since 2010, WCF has helped host at least five major gatherings in Russia where American evangelicals put their views before Russian audiences. At a 2011 demographic summit in Moscow, the event's loaded two-day schedule of panels and speeches included just one 10-minute slot without an American presenter. These gatherings have helped WCF's American leaders establish tight relationships with key Russian government officials, like Duma member Elena Mizulina, the country's foremost anti-gay legislator, who has met with Jacobs in Moscow at least three times and is a frequent attendee at WCF events. This June, National Organization for Marriage President Brian Brown, who serves on WCF's Moscow 2014 planning committee, flew to Russia two days after the lower chamber of parliament approved her gay propaganda ban to meet with Mizulina about crafting her next piece of landmark legislation, a gay-adoption ban. They were met by another 2014 planning committee member, former Fox News producer Jack Hanick, for a round table on the topic. What Is The WCF Conference?